(Menlo Park, Nov. 2013) – One of the toughest background checks in the industry and insistence upon maintaining the old-fashioned practice of visiting each new client at home are among the reasons the nation’s most-respected household staffing agencies have voted Menlo Park’s Stanford Park Nannies their 2013 Agency of the Year. “Stanford Park Nannies epitomizes our profession. 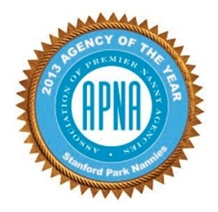 They care deeply about their clients and nannies and work consistently to provide service that is above and beyond,” says Ginger Swift, president of The Association of Premier Nanny Agencies (APNA). “Because we serve Silicon Valley, we face additional pressure to be high tech, but we always look for the right balance between high tech and high touch,” says agency co-owner Maggie Berkshire. A perfect example is the growing trend for families and childcare providers to find each other online. Throughout its 20-plus years of service, Stanford Park Nannies has helped establish industry best practices and worked to exceed them by having its contracts, policies and procedures reviewed by peers and legal experts. “While we are insistent on our rules, the most important thing to us is making sure we establish a personal relationship with the families and nannies we serve,” says Berkshire. Stanford Park Nannies offers individual counsel and group training to nannies on emerging childcare issues and topics such as nutrition, communication, child discipline, parenting styles, CPR and first aid, as well as creative art and education techniques. Stanford Park Nannies has a longstanding practice of terminating its working relationship with any nanny candidate who is found to have lied or stretched the truth on a resume, even if it’s a small thing. It can be a hard thing to do, but it’s the right thing to do.